King’s Square … I feel a need to return to it, having just referred to it in a comment earlier. I often feel a need to return to it. Both literally, because it’s a nice place to sit awhile, and in terms of writing about it on here. In the ‘tag cloud’ at the bottom of these pages it’s the biggest thing. King’s Square was a place where, in recent years, what we might call ‘top down’ visions of ‘improvement’ met their match in what we might call ‘people power’. Call it what you like, it seemed significant to me, the public reaction to this ‘reinvigoration’. In many ways significant. On many levels. Including a massive increase in visitor numbers to this site when I wrote about the Daily Mail article. There are a couple of reasons to mention it again now. Partly that the square just had double yellow lines painted around it. And also because two years ago today I put together a page about the debate prompted by Michelle Wyatt’s petition on the ‘reinvigoration’ work here. Do have a look, it’s interesting, including many of the comments made by councillors (and it took hours to type out all those comments). So that was then. And then we ended up with some compromise on some of the aspects of the square, and the raised area had only a light touch in the end, not the massive (mulberry tree-removing) overhaul originally planned. 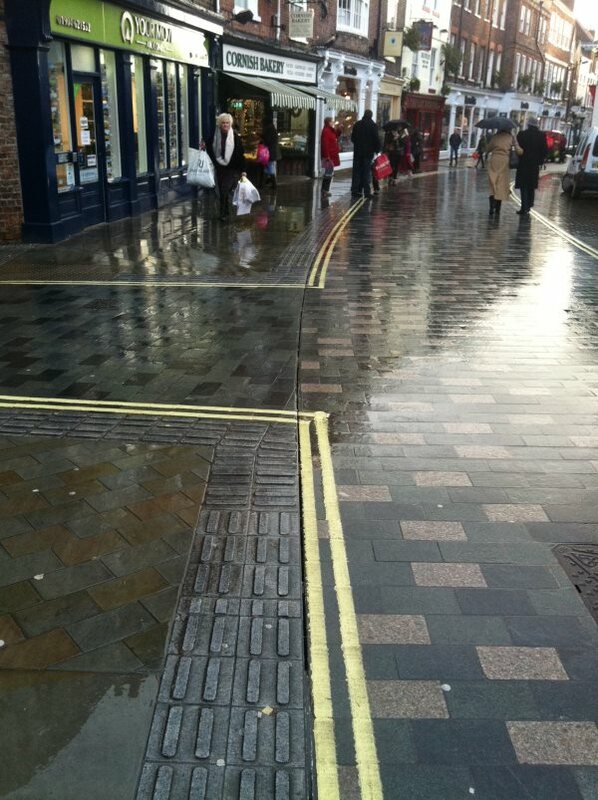 Now, in late 2015, yellow lines have (re)appeared in the roadside bits of King’s Square. Pretty much similar to the yellow lines on the old tarmac that was here before. Just a small thing, a detail. Well, kind of. Except that this paint is decorating really expensive stonework which we couldn’t really afford in the first place and didn’t actually need. There’s been a problem with people parking where they shouldn’t. 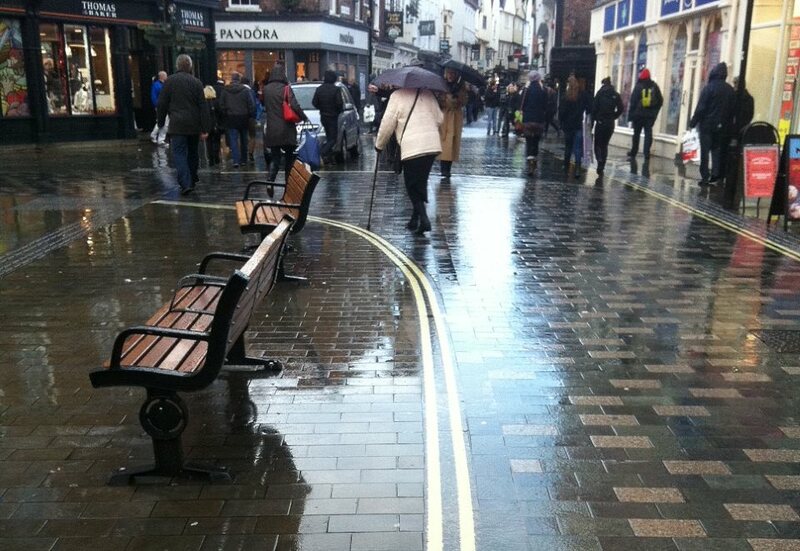 Before the yellow lines appeared in recent days, last month the benches were moved back, relocated, to try to discourage this. 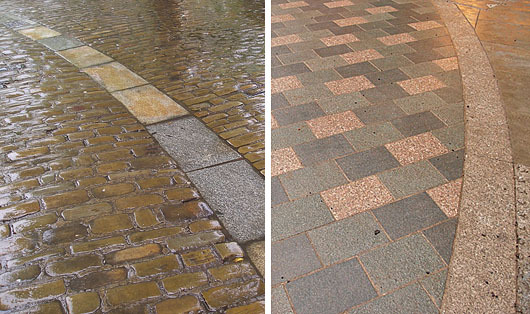 Was it worth it, the ‘investment’ in King’s Square? It’s smoother, so therefore perhaps easier to walk across. Though not if it has wet leaves on it and you’ve got smooth-soled shoes on, as you may slip. On dry days, looking across from the raised area, it looked wider and paler and quite aesthetically pleasing, I thought. 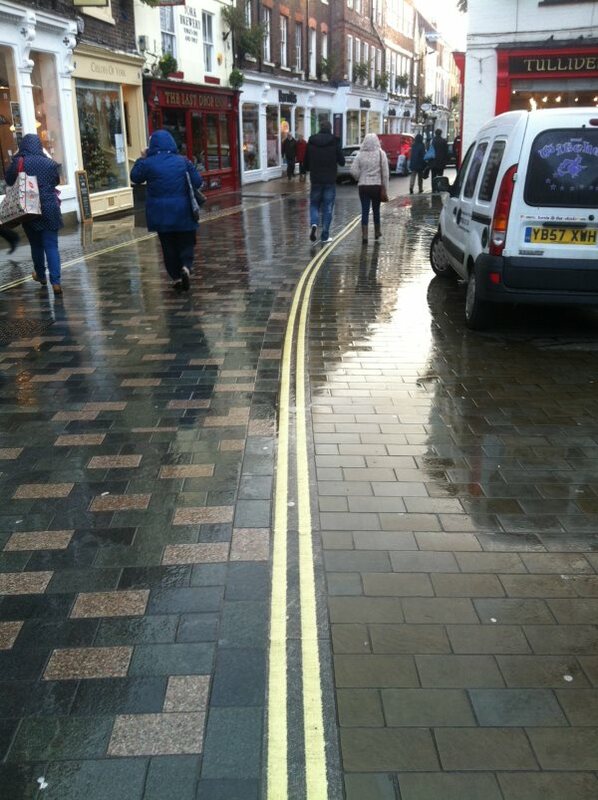 But essentially we’ve ended up having spent tons of money on something where in the end we’ve had to paint the same old yellow lines all over it as it had before. Meaning that the smooth ‘world class’/’Milton Keynes’ (what it was supposed to look like/what people have said it looks like) look of it is now broken by lines of yellow paint. 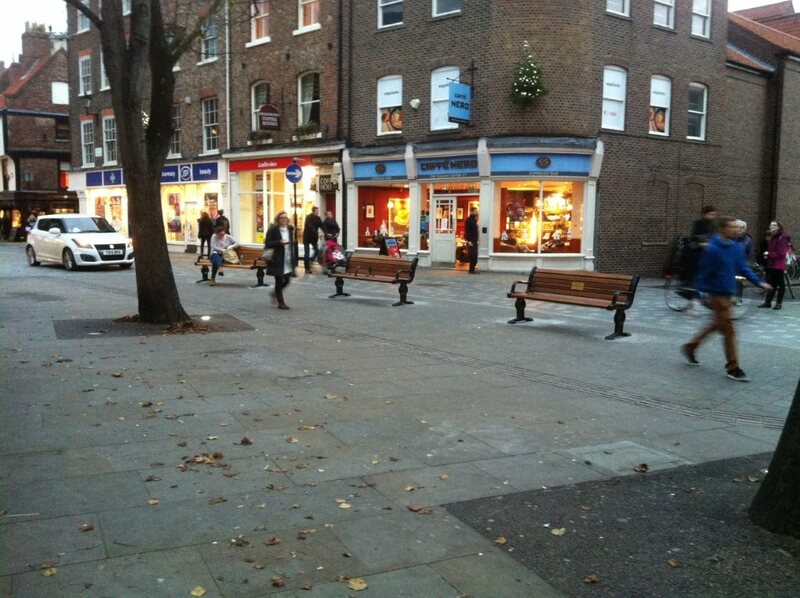 Two years on from the council debate on the King’s Square work, I wonder how many of us have grown to like it where we perhaps didn’t like it at first? Championing 1970s cobbles and spending hours and hours typing up comments made by councillors … that’s me that is … if you find these pages useful and interesting please consider supporting this ‘record of York and its changes’. Thank you.